← Fighting Parkinson’s, and you are extraordinary! Parkinson’s is curable! There, I said it. Your turn…take a deep breath…now, all together, let’s say it: Parkinson’s is curable. Doesn’t that feel great? Yes, I agree. It feels great! As a result of the medical profession saying there is no Parkinson’s cure, I have talked in terms of being symptom free or fully recovered. I felt that acceptance of what I had to say would be hampered if I used the words Parkinson’s cure. However, after 3 years and 4 months of not doing the Parkinson’s Recipe for Recovery®, and still being symptom free and fully recovered, I know it is time to say Parkinson’s is curable. The thing is this: Instead of waiting for a Parkinson’s cure, you need to be your own Parkinson’s cure. My last two posts, Fighting Parkinson’s, and you are your own cure and Fighting Parkinson’s, and you are extraordinary! exemplify the point, and from the 40+ comments posted by your fellow travelers on this path, you should know by now that you are not traveling alone. “You and your doctor should decide together on the right course of treatment for you, including when to begin with medications and what other forms of therapy you might wish to pursue. Decisions must be made about whether and which medications to try first. And to some extent, determining what is right for you is a process of trial and error. No, this is not information I am quoting from things I previously have written on my web site. This information comes from the Michael J. Fox Foundation’s website on a page entitled, “Parkinson’s Disease Medications.” Here is the link so you can go there and read it for yourself, https://www.michaeljfox.org/understanding-parkinsons/living-with-pd/topic.php?medication. I share this with you because that organization is well-respected and considered one of the top information portals regarding Parkinson’s. So when they say, “There are treatments available to lessen the effects of Parkinson’s symptoms for some window of time, but this is all they can do — offer symptomatic relief” and “No drug on today’s market has been proven to slow or stop Parkinson’s disease. Available drugs only mask the symptoms,” I do not want you to feel discouraged. I want you to embrace the Recipe as a Parkinson’s cure and feel encouraged and empowered. And, when they say, “What we don’t have is a disease-modifying treatment, something that would actually halt or slow the progression of the disease,” I do not want you to feel discouraged. If you are taking medications and by doing the Recipe for Recovery you have not had to increase your medications, you are halting, slowing, and reversing the progression of your Parkinson’s. If you are taking medications and by doing the Recipe for Recovery you have been able to decrease your medications, you are halting, slowing, and reversing the progression of your Parkinson’s. If you were taking medications and by doing the Recipe for Recovery you have completely gotten off of your medications, you are halting, slowing, and reversing the progression of your Parkinson’s. If you have briefly tried medications and stopped and by doing the Recipe for Recovery you are remaining drug free, you are halting, slowing, and reversing the progression of your Parkinson’s. If you never have taken medications and by doing the Recipe for Recovery you have no intention of ever taking medications, you are halting, slowing, and reversing the progression of your Parkinson’s. 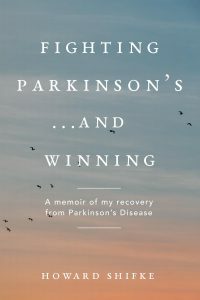 If you did the Recipe for Recovery, and stopped doing the Recipe after the disease went away, you are cured, and you did it by being your own Parkinson’s cure. Is Parkinson’s curable? Yes, Parkinson’s is curable. However, you need to be your own Parkinson’s cure. You are so much more than Parkinson’s symptoms. You are living, breathing, beautiful people around the world, and your lives have gotten out of balance. Parkinson’s is a symptom of a life out of balance. Please take a look at Fighting Parkinson’s, and repairing a life out of balance. As you can see, to be your own Parkinson’s cure, you need to be your own cure on your life path. Parkinson’s is a very big symptom of life being out of balance, soul, mind, and body. No pill and no brain surgery can bring your life back into balance. You need to do that. The journey is a glorious journey…yes, a stiff, shaky, slow, painful, teary journey…but a glorious journey just the same. 30 Responses to Fighting Parkinson’s, and Parkinson’s is curable! As always, Howard, your posts are full of inspiration and motivation. I’m still struggling to incorporate the recipe into my life fully but I know I’m on my way thanks to you. I always get excited when I see your mail in my inbox. Long live Howard!!! We all keep chipping away and work at re-balancing ourselves every day. This was great this morning. It made me feel as long as we are going forward we have it on the run. It takes awhile to realize I am not going to be perfect every day in doing the Recipe. But there is always some part I am able to do and it always makes me feel better emotionally, physical and spiritually. Ultimately, the responsibility lies with me … no-one can bring my life into balance for me…I view PD as a gift inviting my attention…the Recipe for Recovery provides such beautiful wrapping, providing focus, direction and love. I choose to unwrap the gift inside. In so doing, I am discovering myself. Thank you Howard! Two months ago I had to carry a very small purse because even a medium-size one threw me off balance. Recently I carried a tote bag full of books to a meeting. I’d say 25 pounds worth. All thanks to my recovery from Parkinsons. I hope you all can visualize a change like this for yourselves! Whatever you’d like to do that you couldn’t do BP (before Parkinsons), SEE yourself doing it again! Howard’s Recipe is powerful and I’m so grateful for it every day. Any purse regardless of its size is problematic, your story gives me hope. I am also on reciepe and one day, hopefully, be Parkinson free. thanx, howard, and everyone…..your mail almost brought me to tears, howard….such hope!…..such guts it takes to call Parkinson’s ” curable” in the face of “experts” saying it is incurable…..surely, God put you here for such a time as this…. Howard, thank you for the support…especially after hearing in my “support” group a remark that we are in denial…that we are under “false hope.” I responded that I had hesitated to share my openness to healing (or cure) because of judgement…and that so-called false hope employs the power of the placebo effect…the very potent healing power of the mind to heal. All in all it was a positive experience as it made explicit what was their mind-set…interesting, as well, the tendency for us all to “argue for our (self-imposed) limitations.” What I can say for sure is that the recipe, as integrated thus far, reduces stress, has helped with balance, and has further enhanced a positive expectancy (faith). And, after doing my Qigong exercises I feel great! It cultivates a growing awareness and integration of the mind, body, and spirit that can only be realized through an experiential “practice.” We have the power within to heal…to “cure” our selves. It feels so great that you are declaring PD to be curable. I feel it from your being cured and the others being cured. Also because some of my symptoms have improved by about 80%, I have no doubt your recipe leads to 100% total cure once we have done the necessary work on body, mind and soul. Howard, you are an extra extraordinary man, so kind and caring. You always make me feel that I’m worth it while you stay so humble yourself. Going through this Recovery Journey has not been easy. I encountered many bumps, big and small. What get me through is your words of encouragement and knowing you are only an email or phone call away. Now that you have declared that Parkinson is curable. By following your footsteps, I know one day I’ll be cured. It feels great. Thanks Howard and to all of you for sharing your experiences. Thanks Howard! This blog is so timely. I have had a few rough days this week, and I was wondering about being cured. Now that you have declared Parkinsons curable I KNOW that I will be cured. When doing the recipe my arm is so stiff and shakes so much it hurts and makes me want to cry. But I notice that my relationship with my small daughter has improved and my energy so much better when i am doing the recipe. Thank you Howard and all for this and all for sharing your experiences. And if i have a bad day i don’t care because we are on the way to recovery. Love and life to all! After writing the last message in the middle of the night not being able to sleep; european time; i had a lovely dream that i was with this community from this blog and we were all sat in a close circle sharing food, i could see all your faces..it was truly warm and lovely. I am one who is pretty much alone on this journey so it is great. i feel for you when i read your comments. you are very brave and strong to be on this journey alone while caring for your daughter. i am alone too and often i am awake in the middle of the night, so i understand how it feels. But you are bringing up a child as well as working on your recovery. So you truly are an inspiration! We are all here to help each other in this community and as Howard often tells me, You are not alone! And neither are you, Mayarita. Truly. I too am pretty much alone on this journey………but we have each other and we know Howard is only a phone call away and is always there for us all. No matter who we have in our lives to support us. As Howard said…….”We are our own cure” and this blog is here to encourage us all across the finish line. joining the ranks of the “pretty much alone”….I don’t even share with most of my friends and family what I am doing, or that Parkinson’s is curable….just don’t want to see the looks on the faces….you know, the “stop being in denial and accept this diagnosis” looks….fortunately, it doesn’t require a crowd to have faith…..I can have it all by myself…..and I do….thank-you, Howard….thank-you, God…. Thank you so much Linda for your kind words and Judy and Melanie I know how you feel. It is for these reasons this community is so great. I feel strengthened by the links and progress we are making together. We can do it! Love and hugs to you all and special thanks to Howard our pioneer who dared to open the way. We are all on this journey together. My best wishes to you! The striking and ultimately saving quality that it appears we on Howard’s path share, is a commitment to facing the Truth. I do mean Truth with a capital T. Healing from PD is more than just accepting the truth that we have this disease, but being willing to look at the dirty details of WHY we have it. It is that truth that will set us free. It is that willingness to subject ourselves to the scrutiny of honest self-inquiry that will lead us to uncover the erroneous, life-sapping stories that we have come to believe about ourselves. With Howard’s help (and my good fortune in being surrounded by a supporting cast and crew of caring folks), I can say that I am finally making headway on my path to recovery. There is still work to be done. After all, I spent many years creating this predicament, but I know now that I am OK. I still get off track, but I’m able to correct my course more quickly. This path is a Hero’s Journey and it helps me to see it in that light. All of us have chosen to accept what Joseph Campbell refers to as “the Call to Adventure” – to walk through a portal onto a path fraught with demons, trials and tribulations – all the essential elements of a good story. We have elected to veer from the accepted course of treatment-succumbing to belief that there is no cure–and opted to be trailblazers. We must face obstacles and scary monsters; those in opposition to the possibility of recovery, and the fear that arises when we face the deeper truth of why we have this disease. But there are also allies along the way such as Howard, mystical helpers in human form that show up at the perfect moment to give us a key to doors we didn’t even know existed. Sometimes an ally appears in non-human form, as in the exquisite synchronicity of reading a blog post at the very moment you needed a particular message. As Truth Warriors, we must stay present to the Truth that is contained in every moment. That is the only thing we can trust to light our path. This journey we are on is not for the faint hearted. Knowing – not merely believing – that there is a cure for PD requires us to be courageous individuals who are willing to go forward even when we can’t see past the next step. But hey, what’s the alternative? Popping pills and accepting the so-called “truth” that we have an incurable disease while turning into a pile of mush? I prefer the active path of searching for the Truth that will set me free. And… as far as I can tell, I’m the only thing in my way of seeing it. Thank you Howard for the courage, hope and love that you have created in this community of beautiful people. Well said Bailey! This weekend I ran into woman who works for the Parkinson’s foundation. She asked me if I had Parkinson’s and I said yes. I said but I’m off my medications now and she asked me how I felt. I said I feel the same. She couldn’t believe me and asked how and why I was off my meds. I told her about the recipe. She looked at me like I was crazy! We’ll see who’s crazy! The winds of fall are blowing new hope in my heart This is surely the time to make a new start The exercises chant a message of hope My weakness is no reason to give up To change my habits won’t be an easy task Guidance by Howard is what I ask But whatever demon wants to trip me up With the aim that I’ll just give it all up Should know that there’s simply no way, His silly games I will never play The new path is not easily tread But I thank the Creator from my toes to my head And with Howard’s advice I apprehend the day When I shall move with ease all of the way! I’m in the rear echelons, providing supplies and ammunition to my division (Michal and all her future disciples who will be inspired by her dauntless saga about reaching Recoveryville). I want to thank all those brave warriors who have posted inspiring messages. Just now I’ve copied a whole bunch to translate and send to Michal. We wish each and every one a speedy recovery and a long and healthy life!